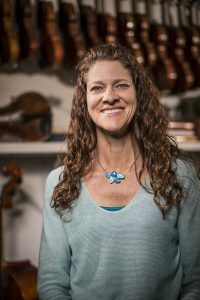 Dana is a founding member of Suzuki of the Triangle, which sponsors TCI, a summer chamber music institute, and also a prep workshop for local youth orchestra auditions. She was educated at Eastman and Mannes, receiving her Master of Music from Mannes in 1990. Her teachers included Fredell Lack, Sally Thomas, Ani Kavafian, Felix Galimir and Stuart Canin. Dana lived and freelanced in New York for 12 years, playing music ranging from Bach to Xenakis and everything in between! In 1998 Dana and her violin restorer husband Jerry Pasewicz relocated to Raleigh to open Triangle Strings. Dana taught at Meredith College for 12 years and at UNC Chapel Hill for 7 years. She is a dedicated teacher of 24 years with a thriving Suzuki Studio. In keeping with her dedication to teaching young children, she founded two Montessori pretwinkle programs for 3-6 year-olds- now in year 5! Dana has performed extensively with the North Carolina Symphony, Music-on-the-Hill series at UNC’s Memorial Hall, NC Opera, all things choral at Duke Chapel, and numerous other area groups. Triangle Strings presents a yearly instrument exhibition called ” Meritage”, in which Dana performs on fabulous instruments alongside her favorite colleagues. Dana loves to run, do yoga and make silver and dichroic glass jewelry in her “spare time”.